We discussed in our previous Legal Briefing1 the flurry of recent activity with plaintiff-focussed litigation funders and law firms instituting and threatening to commence class action claims in the mining, direct sales and marketing, and labour hire sectors over the alleged underpayment of employees who have been misclassified as “casual” employees. The latest instalment involves class action firms challenging the classification of casual employees. the Rossato proceeding is an abuse of process, as WorkPac is re-litigating a case that it has already been unsuccessful in (namely, the Full Court decision in Skene). What is the WorkPac v Rossato proceeding? WorkPac is entitled to set off payments made to Mr Rossato against any leave entitlement that Mr Rossato may have. WorkPac commenced the proceedings, after a Full Court of the Federal Court found that a former casual employee, Mr Skene, was in fact a permanent employee (as discussed further in this article).4 WorkPac has not appealed the Full Court decision in Skene. he "may accept or reject any offer of an assignment". Mr Skene was placed by WorkPac at the same mine for just under 2 years (other than during a short break). He worked shift work on a fly in fly out (FIFO) arrangement and his roster had been set 6 months, then 12 months, then another 12 months in advance. These were key factors in the decision. Mr Skene was dismissed for misconduct and brought a claim that he was a permanent employee and should have been paid accrued but untaken annual leave for the duration of his employment. WorkPac argued that he was a casual employee and therefore not entitled to any annual leave. Skene is significant because the Court found that an employee who has been classified as a casual and paid the casual loading is not necessarily a casual employee for the purposes of NES entitlements under the FW Act. Rather, the ‘essence of casualness’ must be present, considering all of the circumstances of the employment relationship (and is not defined simply by the employer’s designation of the employee as a casual in the employment contract or industrial instrument). Since Skene was handed down, the validity of casual employment generally has been called into question by a number of commentators in the media. In our view, this overstates the impact of Skene. The decision does not render all casual employees working a set roster a permanent employee for the NES. Rather, the focus will be on an assessment of the factual circumstances of each case to determine whether the 'essence of casualness' is present or absent. 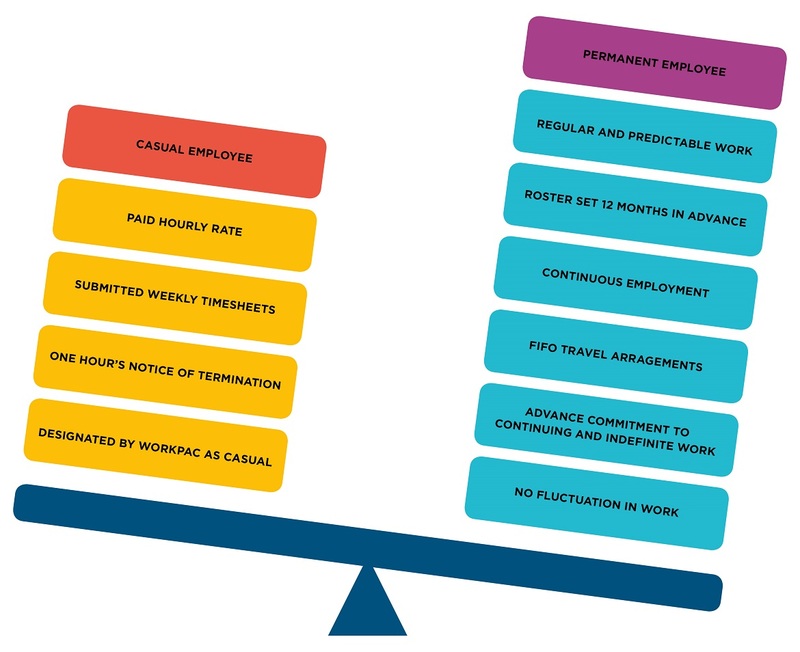 However, Skene has brought the issue of who is truly a ‘casual employee’ to the forefront in the context of the casualisation of the workforce. employers want clarity on the ability to offset where casual employees are engaged in the future. an employer can pursue the employee for repayment of the casual loading on the basis the employee would otherwise be unjustly enriched. The Construction, Forestry, Maritime, Mining Energy Union and Mr Skene have sought to intervene in the Rossato proceeding to ensure that Rossato does not impact the earlier precedent set in Skene. We are working with clients to assist them to understand any potential exposure or liability because of Skene in relation to their casual workforce. Our team of national experts are available to answer any queries that you may have about the implications of Skene. 2 Dana McCauley, “Class action firm to intervene in casual worker test case”, The Age, 8 November 2018, available at https://www.theage.com.au/politics/federal/class-action-firm-to-intervene-in-casual-worker-test-case-20181107-p50elg.html. 4WorkPac Pty Ltd v Skene  FCAFC 131. 5 Workplace Express, “O’Dwyer posits three solutions to casual leave “double dip”, 22 November 2018, available at https://www.workplaceexpress.com.au/nl06_news_selected.php?act=2&selkey=57371. 6 Workplace Express, “O’Dwyer posits three solutions to casual leave “double dip”, 22 November 2018, available at https://www.workplaceexpress.com.au/nl06_news_selected.php?act=2&selkey=57371. Anna advises clients in employment, industrial relations and safety law, with a particular focus on large scale disputes and investigations. One of our national experts in the field of enterprise bargaining and industrial disputes.